I received my W2 for work on Friday but I’ve yet to file my taxes. Yes, I’m aware it’s not even April 15th but I like to receive my refund yesterday. Naturally when I saw my gross pay (and my mind has completely blocked out how much taxes I’ve paid to Uncle Sam) I wondered how much I spent here and there particularly on shopping (my favorite past time). 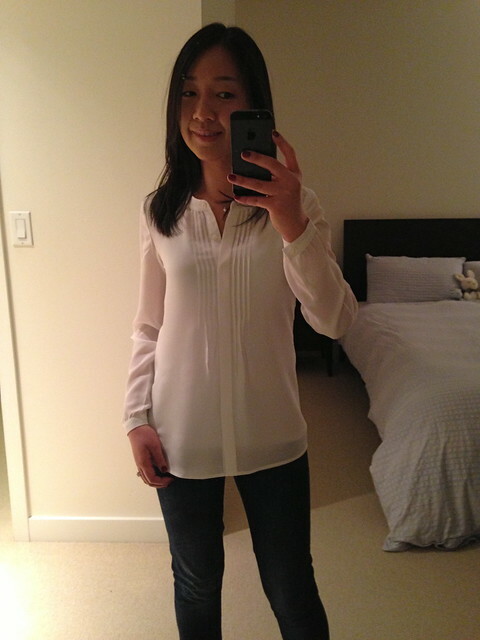 Gap Inc., but mainly Banana Republic, is my favorite retailer and in 2012 I averaged almost $300 on my monthly bills. Yikes! In case you’re wondering, this is not a post on taxes or where I try to justify my spending (and I do pay off all my cards in full) but I shop for both my fiance and I. He doesn’t buy clothes on his own and his closet is almost exclusively full of Banana Republic t-shirts, dress shirts, jeans and belts. I was also pretty good about getting everything at 40-50% off and using Ebates or Mr. Rebates (the latter recommended by Annie). Anyway, on to more trivial things like what to do on Sundays. We like to go to open houses (interest rates are at an all time low) in case something catches our eye so I was trying to come up with an appropriate outfit for tomorrow. Of course I realize that no one may see my outfit if I keep my coat on but I still like to be prepared and look like a responsible adult whenever possible. I’ve barely wore the scarf pictured above (purchased in August) and I finally got around to ironing out the creases today. I really hate ironing with a passion. 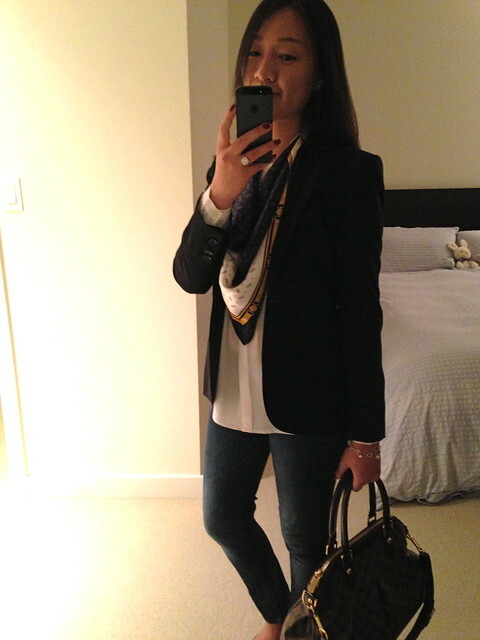 Sometimes things will go unworn for months on end because I’m just too lazy to iron it… like the scarf. Ha! I ordered this pintuck blouse thinking it was the same as the one from last year but this year’s version lacks the inside cami and it’s not the same sheer material. I still like it though so I’m keeping it. Despite the difference in the material it fits about the same. I also ordered this Zara girl’s trench earlier this week. It was a total fail and looked like an oversized chef’s jacket on me. Feel free to see for yourself (here, here and here). Thanks Annie! I went to four today. lol Fell in love with a kitchen but not the rest of the place. FYI. I almost lost my scarf ring today. 🙁 It somehow slipped off and that has NEVER happened before. So glad I noticed and found it laying on the ground. Thanks Sheila. You should get your hubs to iron for you all the time. Ha! My Fiance always asks me to iron but it's easier because his clothes are bigger than mine.The next size down was actually sold out online so I couldn't exchange it for a smaller size. I returned it today at a regular Zara (sans the kid's department). I think the quality was okay but it was lacking in some details (e.g. it could have used buttons on the shoulder epaulets). Thanks Mary Irene! Can you believe that I purchased that bag in 2008? I think you look very professional! Thanks Yi-chia! <3I can imagine that taxes only get more fun once you get married and file together. It took me about an hour and a half last night to file mine only to find that one form won't be available until tomorrow. At least I know I'm getting a refund for both state and federal.No, you're not being nosy. My fiance currently owns the condo we live in but we were looking at a few place in Needham this past weekend (good school system… thinking ahead). It's always good to get our feelers out there. Thanks! We're in no rush.I agree. It's a beautiful town. The high school looked pretty darn nice too. Thanks Jessica! Scarves are my favorite accessory year round. Thanks Jess! I went through a period where I would tweak it a lot. I'm going to leave it alone for a while. 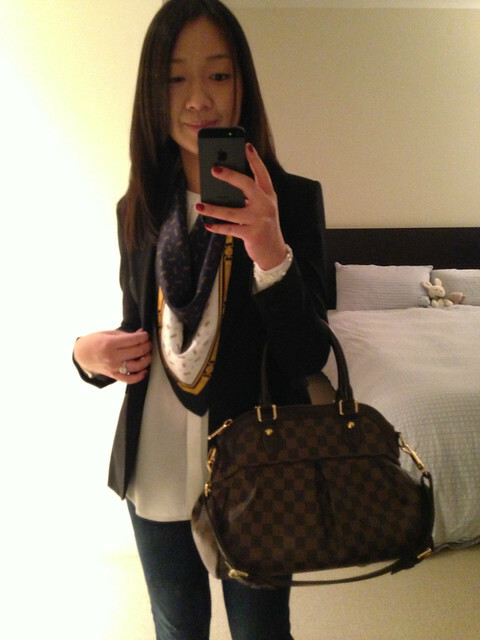 :)I think a Celine luggage would suit your suit very well. Have you tried them on for size? I'm partial to Louis Vuitton myself but I think the Celine in either a classic or bold color would go really nicely with a lot of your outfits.